Palestine continued their steady progression in the FIFA rankings this month following a scintillating 10-0 rout of Bhutan in Asian Cup qualifying. 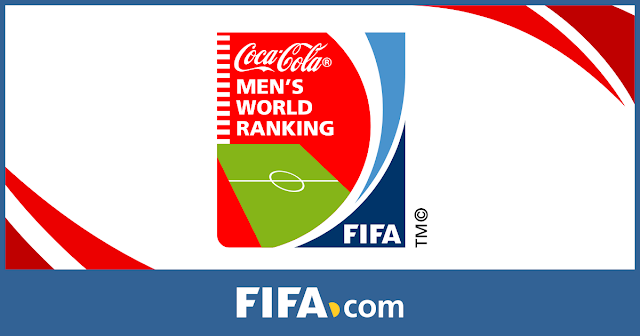 The win propelled Palestine up 7 spots- from 91st to 84th- the highest they have ever been in FIFA's ranking. Their previous best was 85th a rank achieved in July 2014- following the aftermath of the 2014 AFC Challenge Cup victory. 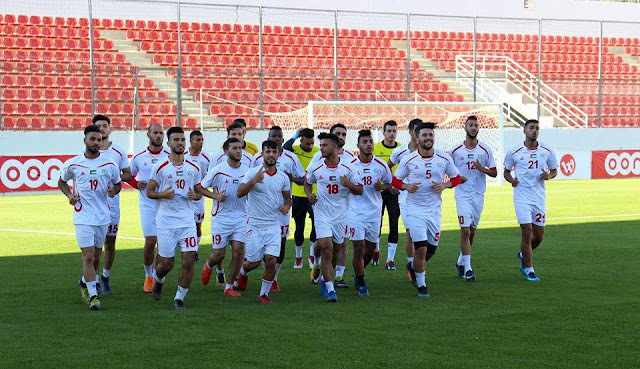 The tournament, which served as qualifying for the bottom 20 nations in Asia, allowed Palestine to cluster four qualifying victories and a draw in the space of one month to leap 71 spots in the ranking. Palestine came into the year ranked 131st but a run of six wins (including four in qualifying) has seen them rise 47 places- and could put them in the running for FIFA's Mover of the Year award. Palestine national team captain Abdelatif Bahdari scored the most unexpected of hat tricks against Bhutan. The defender became the second oldest scorer in national team player to score a goal at 33 years, 7 months, and 20 days. 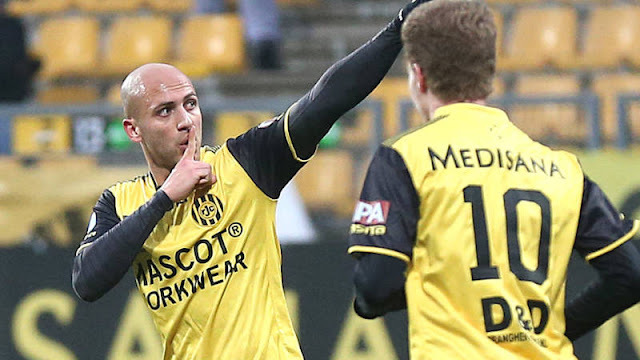 Murad Alyan- who scored against Thailand in 2014 World Cup qualifying- still holds the record by one day. The captain did become the first defender in national team history to score a hat trick. He joins the likes of Ahmad Abu Nahyeh (vs. Malaysia, November 2015), Ahmad Maher Wridat (vs. Chinese Taipei, September 2014), and Fahed Attal (vs. Guam April 2011). 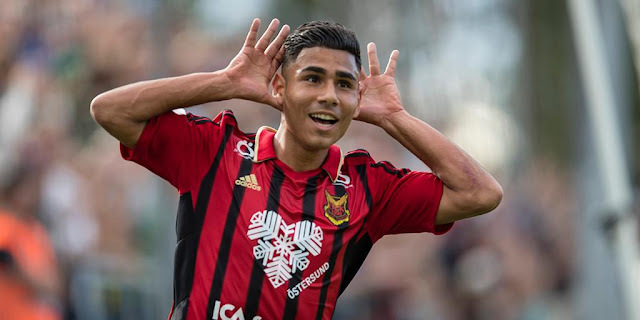 Only four other players have more than his seven goals, the aforementioned Wridat (8) and Attal (14) along with Ziyad Al-Kord (10) and Ashraf Nu'man (12). With his 47th national team game in the books, Bahdari now is the joint 4th most capped player behind only Ramzi Saleh (68), Khader Yousef (64), and Saeb Jendeya (58). Quite appropriately, Palestine's 10-0 win marked their 10th straight undefeated match- a run that stretches back to their 7-0 World Cup qualifying win over Timor Leste. It also marked their sixth straight win- a feat that neighbors Syria and Jordan have never achieved. Even defending Asian Champions, Australia, have only ever achieved five straight wins as a member of the AFC. Where does that put them in relation to the rest of Asia? The truth is there is still a long way to go to set any type of record. It is worth noting the context, given the fact that Palestine had never strung together three wins in a row before 2017. 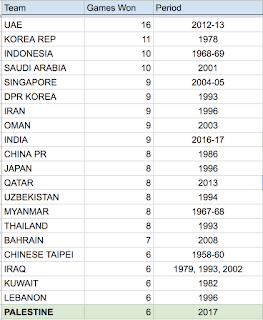 Korea Republic own the Asian record for longest undefeated streak (28 games- set in a bygone era; all games were played in 1978). UAE have the Asian, and world record for most wins in a row, having gone on a tear of 16 games during the early part of Mahdi Ali's reign. Notably, those streaks weren't parlayed into meaningful results, Korea had to wait until 1986 to qualify for a World Cup. The UAE set its streak of 22 games without a defeat after it had been eliminated from the 2014 World Cup qualifying. India hit nine straight wins earlier this year by doing battle with sides in the bottom 50 of the FIFA rankings. They currently hold the longest active undefeated streak in Asia (12 games) but a closer look at their results in competitive matches shows that they might not be up to snuff against teams stronger than the likes of Laos, Kyrgyzstan, Mynamar, and Macau. Palestine's streak has considerably more weight due to the fact that it encapsulates five competitive matches. The current record of 15 is held by Germany set over the course of 2010-12. The record in itself is only as good as the knock on effects namely, the confidence of the squad and the much maligned FIFA rankings. A drop following the 2015 Asian Cup finals left Palestine in Pot 3 for the 2018 World Cup qualification draw. The teams that leapfrogged them were Syria and Vietnam. Syria parlayed a good draw into a deep run in qualifying. While Thailand capitalized on being grouped with Vietnam advanced to the Third Round. Although the PFA should keep an eye out on their FIFA ranking they should place added emphasis on getting the team prepared for the Asian Cup finals. Palestine need more experience playing against the big teams in Asia and could use exposure to teams from other confederations. The focus should be on winning the two remaining qualifying games which would seal a place in the second pot for Asian Cup qualifying. Once the draw is conducted (most likely in April using the March 2018 FIFA rankings) the team should arrange as many friendlies as possible- preferably against the Asian Big Four or against West Asian sides that have historically dominated them (Iraq and Jordan come to mind). They should also approach Saudi Arabia's World Cup opponents and offer their services as a comparable team. These fixtures will undoubtedly put the winning streak at risk and might even result in a downturn in the FIFA ranking. That said, the result would be having a team that is prepared to make a deep run at the Asian Cup which will provide Palestine an opportunity to recoup points ahead of the 2022 World Cup draw in 2019. Earlier in the year I mentioned there was an outside chance that Palestine would overtake Israel in the FIFA rankings. That scenario is no longer an outside chance- but a cold hard fact. Israel has no games scheduled and will see its points total drop from 420 to 355 next month. 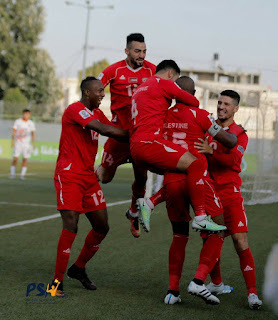 Palestine can increase their point tally to 427 with a win, a draw or loss would see a decrease in their point totals to 396 or 381, respectively. 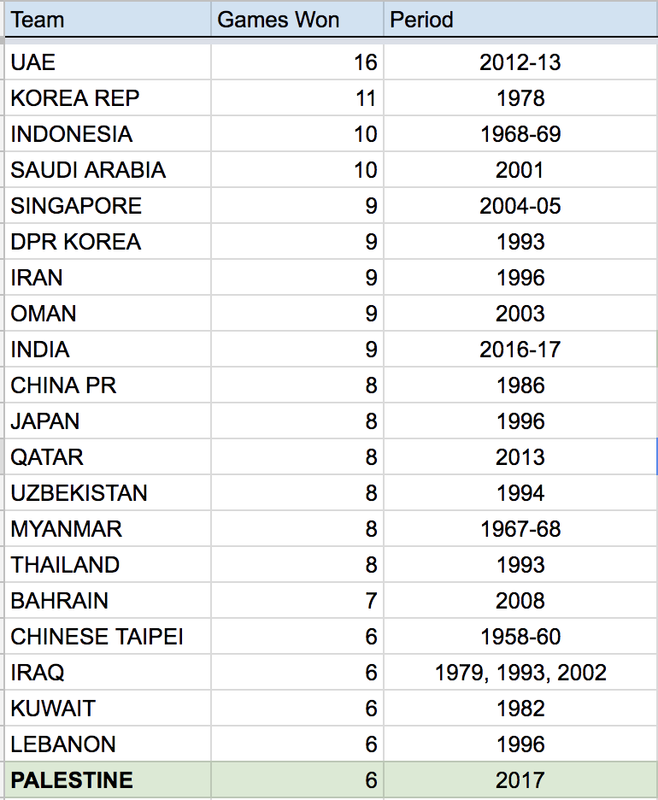 No matter what happens next month- Palestine will be ranked above Israel for the first time since readmission to FIFA in 1998. This is a significant achievement, and it should be used to stop any Palestinian citizen of Israel for thinking that the path to a fruitful career lies with representing Israel internationally. Its hard to tell how much attention this would get as people rightly focus on results in tournaments and not the FIFA Rankings. A deep run in the 2019 Asian Cup or replicating Syria's Achievements during 2022 World Cup qualifying is more likely to deliver talent to the doorsteps of the PFA. Regardless of what happens, fans of Palestine can and should revel in the success that has allowed them to be ranked 11th in Asia and 84th globally and well positioned to make some waves in upcoming cycles.